MISSING CHILD ALERT - FOUND SAFE!!! HAS BEEN FOUND AND IS SAFE!!!! Have you seen this young man? He has been missing since around 3:00 pm today. Last seen around Louisville Elementary wearing a black DARE shirt with red letters. If you have any information, please contact the Louisville Police Department at 662-773-3511 or call 911. By September most gardeners have had it...had it with the constant watering, had it with never ending dead heading and had it with bugs that seem to have a new found interest in plant eating! But not so Hattie Harris, our Winston County Master Gardeners September Yard of the Month. Although Miss Hattie says her yard does not look like it did in June, it is hard to believe that it could have been any prettier than it is right now. Everywhere you look in this yard, there are vignettes containing places to sit and bright flowers upon which to gaze. From giant butterflies to peaceful statuary, always accompanied by beautiful flowers, this is a yard that reflects the love Miss Hattie has not only for flowers, but for color and composition as well. Miss Hattie, who lives at 187 Birmingham Street in Louisville, mostly gardens in containers because she finds them easier to handle and to maintain. She uses an assortment of plants with varying growing habits..from cascading to upright to sprawling. She starts her pots by the end of March and loves to put several varieties and colors of sun loving plants in the same pot. Among her favorite plants to use together are vincas (she especially loves the reds ),begonias, petunias (her favorites) zinnias, and marigolds. Her backyard is carpeted with beautiful and cool St. Augustine grass anchored by crepe myrtles and more pots of hot pink vincas. The tornado did much damage to her back yard and she has not yet gotten it back to her high standards, though to this observer it is quite lovely. "I love flowers so much, I would eat them if I could", says Miss Hattie. I believe her! Her flowers do indeed look good enough to eat..especially the hard candy colored reds and hot pinks. Stop by... see for yourselves! 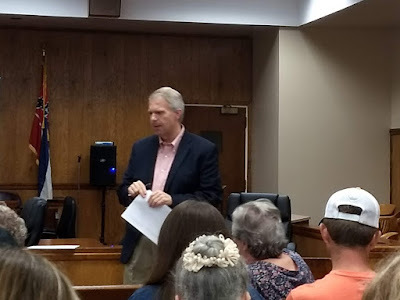 Last Thursday night was a great night of education for women landowners in Winston County. Winston County is comprised of 376,679.96 acres. The majority of those acres is privately owned, making up approximately 16,000 parcels. Owning property is a great responsibility in itself, but if you want to make that property profitable, the responsibility is even greater. Having the knowledge to grow timber, raise livestock, agronomic crops, commercial horticulture, etc. is a must, if you want to be a good steward of the land, and your bank account. The old saying, “Knowledge is power” is never more true when it comes to land stewardship, and/or farming for a living. Over the years in my career with Extension, I’ve encountered many landowners that didn’t know there was resources, educational or financial available to them for land/farm management. Not only are there resources available, but these resources are rooted in the latest researched based information available to the American landowner. Resources that will teach every aspect of land management, to helping off-set cost to implementing practices on the land. This access to education, and land resources coupled with the American entrepreneurial spirit, has made The U.S.A. the envy of the world. Winston County is blessed with a host of natural resources, and no shortage of people wanting to better manage their land, and agency’s to help do just that. The Winston County Extension office would like to say thank you to: Winston County’s USDA Farm Service Agency (FSA), Natural Resources Conservation Service (NRCS), Mississippi Forestry Commission (MFC), and Winston County Tax Assessor’s office for relaying to participants what their offices offer them, to make their land the best it can be. 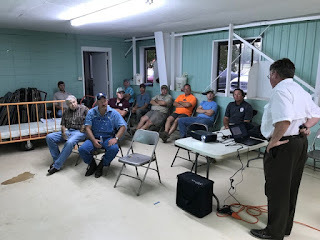 If you were unable to attend the Winston Women Landowners Workshop, feel free to contact the Extension office concerning any questions you may have. Extension, and the fore mentioned agencies exist to help you the landowner, help the land. The investigation of a January 2018 murder in Winston County continues as new developments arise. The death of Carolyn Burnside in her home near Noxapater was shocking to the community. 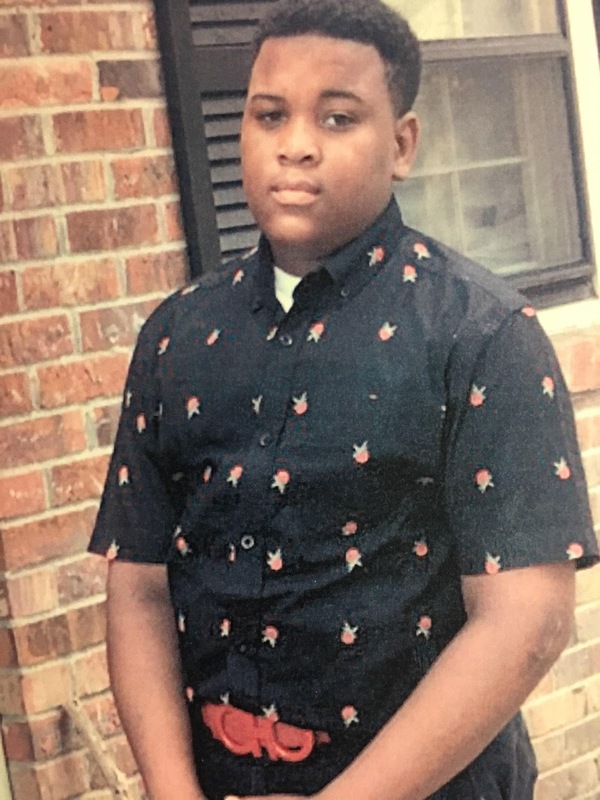 The Winston County Sheriff's Department and investigators from the Mississippi Highway Patrol (MHP) continue their investigations as one of their primary persons of interest was arrested earlier this week in Lake Charles, Louisiana and charged with capital murder in the death of yet another person of interest in the Winston County homicide. Darrell Burnside, the spouse of the Winston County victim was taken into custody on Wednesday and is awaiting extradition to Houston, Texas in the April death of twenty five year old Ashley George of the Houston area. George's body was found in Clear Lake Park near the Johnson Space Center. She died of stab wounds. Darrell Burnside and Ashley George almost immediately became suspects in the Winston County case. Burnside and George had an ongoing relationship prior to his wife's death. Louisiana to interview both Burnside and George over the past several months. Sheriff Jason Pugh believes that it is possible that the death of Ashley George may be a direct result of her involvement in the Winston County case. Pugh noted that at the time of his arrest, Darrell Burnside was out on bond on a firearm possession charge resulting from a search of his property in Louisiana. Pugh plans to interview Burnside again after his extradition to Houston. "This has been a long ongoing investigation that required the cooperation of a number of law enforcement agencies including MHP, Louisiana State Police, the homicide division of the Houston Police Department, Lake Charles, Louisiana Police Department, Texas Rangers and the Brookhaven Police Department among others." Pugh expressed his sympathy to the family of Carolyn Burnside and says the investigation will continue and expects these developments to move the case forward. There are two booklets at the Winston County Library describing work on the new Noxubee Hills Scenic Byway. The booklets describe what the project is, a map of the route, benefit-cost analysis, letters of support, photos, the Mississippi Senate Bill authorizing the project and a copy of the 2018 BUILD Grant Application Docouments. The documents contain Winston, Choctaw and Noxubee Counties’ application to provide better access to the public lands of the Tombigbee National Forest and the Sam D. Hamilton Noxubee Wildlife Refuge as well as the forest land belonging to Mississippi State University’s John W. Starr Memorial Forest. Extension Agents working with landowners in just about every area of agriculture, horticulture, or forestry production has a very common denominator, pesticides. Understanding, a pesticide is a substance used for destroying insects or other organisms harmful to cultivated plants or animals. So a pesticide can be either weeds or diseases within the production spectrum, not just insects. Having established that fact, it makes Extension Agents task much easier when discussing pesticide rates, if the landowner or producer has calibrated spray equipment. I can guarantee you on each and every pesticide label you WILL find an amount per acre, or thousand square foot recommendation. These recommendations on the labels are from, in many cases, years of trials by the manufacturer, and should be taken literally. THE LABEL IS THE LAW! Consequences of miss use of pesticides can result in the target pest not being controlled, resistant strands of insects or weeds, to resulting in a waste of money by applying too much, or not enough of the pesticide in use. Not to mention fines, bodily injury, or death. The Winston County Extension office conducted a calibration and pesticide handling workshop last Thursday night at the Winston County Coliseum, to answer the question of how calibration is done correctly. MSU Extension staff members Mr. Gene Merkl, Pesticide Safety Instructor, and Dr. John Byrd, Extension Weed Scientist conducted the classroom, and hands on training to answer any and all questions about sprayer calibration. The training consisted of calibrating a boom sprayer, as well as a boom-less sprayer. Instructors demonstrated the 1/128th acre, and 1/8th acre methods. 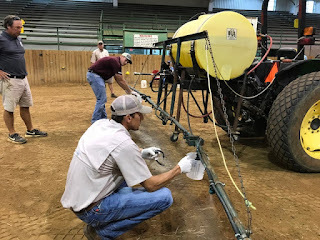 These techniques are not hard, and will enable the applicator to safely, and correctly apply any pesticide at its most effective rate per acre. I’d like to say a special thanks to Todd McCullough for allowing the use of the Winston Coliseum, and equipment. The program could not have been possible without this cooperation, and partnership. The East Central Community College Lady Warrior soccer team opened the regular season in style with a 1-0 shutout victory over host Southwest Tennessee Community College on Wednesday, Aug. 22. The match was played at St. George’s Independent School in Germantown, Tenn.
After a scoreless first half, the Lady Warriors got the game winner in the second half off the foot of freshman forward Macey Spencer out of Florence High School. She was assisted by freshman forward Bethany Hand from Dublin, Ireland. Sophomore goalkeeper Jordan Havens out of Horn Lake got the shutout in goal. The Lady Warriors will travel to Ellisville to face Jones County Junior College at 5 p.m. on Friday, Aug. 24. Following a trip to Poplarville to face Pearl River Community College at 5 p.m. on Tuesday, Aug. 28, the East Central women will play their regular season home opener against Itawamba Community College on at 2 p.m. on Friday, Aug. 31, at the Soccer Field on the campus in Decatur. At a recent Board of Aldermen meeting, the City of Louisville passed a resolution urging the State Legislature to “Balance the Scales with Internet Sales” by diverting a portion of internet sales tax to municipalities. The City of Louisville has joined the Mississippi Municipal League and its 292 member municipalities across the state in an effort to support the inclusion of this diversion in any legislation for infrastructure funding that might be considered during a special session. The resolution states that cities, towns and villages in Mississippi are responsible for over 23,000 street miles. It also states that municipal governments in the state provide water and sewer services to over 50% of the citizens in Mississippi. Being able to provide quality public infrastructure in the State’s municipalities is critical to the economic vitality of our cities and towns and a necessary component of providing a better quality of life for the citizens of Mississippi at large. With the recent U.S. Supreme Court sales tax ruling, the Legislature will now have the opportunity to “Balance the Scales with Internet Sales” and treat internet sales tax as they do traditional sales tax and divert at least 18.5% back to the cities based on the point of delivery of the products sold. At the very least, the Legislature should set aside a portion of all Use Tax to be diverted to cities on a per capita basis to be used for water, sewer, and street infrastructure. for the public's assistance in improving cell phone and internet service - not only across Winston County but also across the state of Mississippi. Presley believes that inaccurate reporting to the FCC from cell phone carriers across the state have painted a much rosier picture of service than actually exists. Presley was in Louisville to promote and ask for the public's help in gathering data in areas across the county where service is not up to par. Presley noted that a cell phone app is available to gather information concerning service, coverage and speed. To gather sufficient information to encourage the FCC to promote better service, Presley is asking the public to contact his office, download the app, run speed tests through the app to gather information and transmit the data to the PSC for analysis. The final date for test results is November 30. Include your name, physical address, email and cell phone # and indicate that you wish to participate in the FCC Speed test. Once downloaded, to use the app - turn off WiFi if applicable, agree to terms of service, tap "Run Now" and select "All" for type of run. Pick an area where you have concerns about your service and run a test while remaining at one location (do not use in a moving vehicle). This usually takes only a few seconds. The app stores the data for later download. Take tests over a period of time and download on a weekly basis to the PSC. To download- find the menu (usually -upper righthand corner and click export results. Send by email to: taskforce@psc.state.ms.us on a weekly basis or as possible. 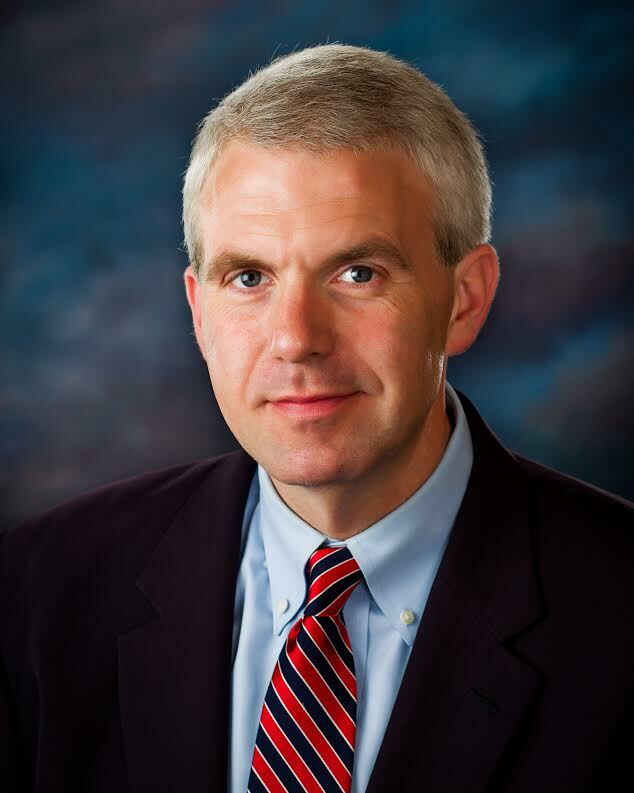 Presley believes the additional information provided by the public along with data gathered by his office could prompt the FCC to take action to improve service in our area. he noted that there was some issues with the IPhone app but expected it to be corrected in the next few days. As a public service, Winston WebNews will have copies of full instructions available at our office beginning Thursday, August, 23. We are located at 874 S. Columbus Avenue next door to Louisville Utilities. Presley also discussed rural internet service across the state. 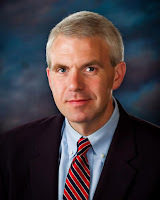 Noting that Mississippi ranked 49th of the states with internet access connectivity, Presley believes that the lack of service is one of the most serious issues our state faces, affecting our children, jobs and role in the modern economy. A bill is in the works for the 2019 legislative session that will allow local electrical cooperatives to provide internet services. Currently cooperatives are prevented by state law from proving additional services. Presley is encouraging the public to contact their state legislators and local electrical cooperatives in favor of this bill. Students who transferred from East Central Community College in Decatur to four-year institutions earned the highest cumulative grade-point average (GPA) of all community and junior college transfers in the state of Mississippi in 2017. Students who transferred from East Central to one of the state’s eight public, four-year institutions earned a 3.34 GPA at baccalaureate graduation, according to data just released by the Mississippi Institutions of Higher Learning (IHL). The 3.34 GPA was the highest cumulative grade-point average of any community or junior college in Mississippi over the past five years. Students from the community/junior college with the second highest GPA in 2017 earned a 3.28. The average for all 15 community/junior colleges combined was a 3.18 GPA. It was the third time in the past five years that students who transferred from East Central Community College to a public four-year college or university in Mississippi earned the highest GPA of all state community and junior colleges. ECCC transfers earned a cumulative 3.29 GPA in 2016, and 3.22 each year from 2013-2015. The report also again showed that community college transfer students performed academically as well or better in university courses than students who began their education at the senior institutions. The “native” students earned a 3.15 GPA. East Central Community College offers the two-year pre-baccalaureate Associate of Science and Associate of Arts degrees, with numerous areas of concentration. These academic courses are guaranteed to transfer as a result of an Articulation Agreement between Mississippi’s community colleges and the state’s public four-year colleges and universities. The college also offers two-year terminal degrees in healthcare, career, and technical fields of study. For more information about attending East Central Community College, contact ECCC Student Services at 877-GO-2-ECCC or e-mail go2ec@eccc.edu. boat from the 200 block of Hull Road over the weekend. This vehicle was seen leaving the scene around the time of the theft. 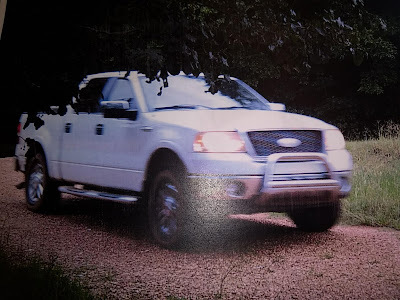 The vehicle was seen entering the property on two occasions on Saturday, August 18 - the last time around 8:30 pm. Missing is a 15' aluminum War Eagle boat with a 25 hp Mercury outboard motor. 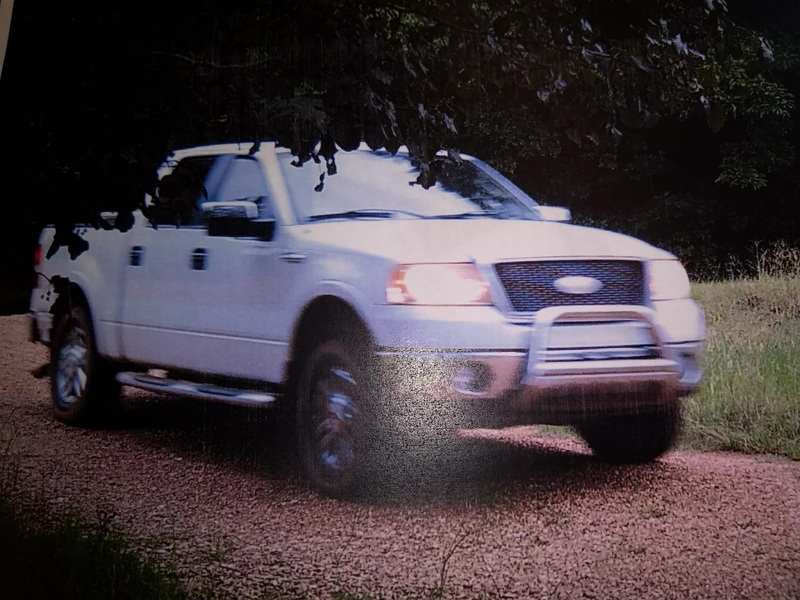 Law enforcement is asking that anyone who recognizes the vehicle or knows the whereabouts of the boat to contact CrimeStoppers at 662-773-9999 or the Winston County Sheriff's Office at 662-773-5881. A reward is offered. Director of Tourism, Hot Springs Village Association). individuals who were awarded graduation certificates during the 32nd annual Community Development Institute (CDI) at the University of Central Arkansas on August 3, 2018. Haab completed all three years of the Institute’s program of study. CDI trains community leaders and economic development professionals on how to strengthen their local economies and build communities. This is achieved by developing the ability of participants to identify community assets, set goals, encourage collaboration and partnerships with stakeholders, and bring communities, organizations and businesses together to respond to a broad range of economic and quality of life issues. The complete CDI experience is a three-year program, with one week of training per year. Participants move through the program curriculum in cohorts, and are exposed to a comprehensive, applied approach to the field of community and economic development. 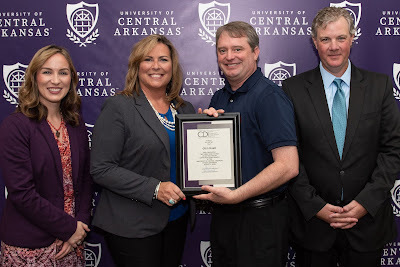 UCA is the birthplace for the Community Development Institute, which started in 1987 in partnership with Entergy, Southwestern Bell, and ARKLA. Since that time, CDIs have been established in California, Texas, Alabama, Idaho and Illinois, and a national governing and certification body, the Community Development Council, has been created. If the East Central Community College Warriors are to improve on last season’s record, they will have to do so against the toughest football schedule in the Mississippi Association of Community and Junior Colleges.The good news is that there is a lot of talent on the 2018 edition of the ECCC football Warriors, particularly at the skill positions. The Louisville Municipal School District has enrolled with STOPit, the leading technology platform for schools that deters and controls harmful or inappropriate conduct. STOPit empowers students with an easy app to safely and anonymously report anything of concern to school officials – from cyberbullying to threats of violence or self-harm. STOPit empowers students to stand up for themselves and others while giving our schools the insight we need to keep students safe. With STOPit, students can submit anonymous reports containing text, photos, or video. Administrators are then able to manage incidents in a backend management system called DOCUMENTit. DOCUMENTit provides efficient and powerful investigative tools to our staff, including the ability to message with the reporter, which will allow us to address issues instantly. STOPit is the leading technology company providing a comprehensive software platform that mitigates, deters and controls bullying, including cyberbullying, harassment and other harmful or inappropriate conduct. The STOPit platform is available to schools, universities, businesses and governments both in the United States and around the world. The STOPit mobile app is a simple, fast and powerful tool which empowers individuals to protect themselves and stand up for others online, on social media, in the classroom or in the office. DOCUMENTit, a robust incident management system, empowers administrators and management to get in front of issues to mitigate risk and adhere to the ever evolving compliance landscape. Celebrating the family’s Scottish heritage and over 180-year history in Winston County, about 80 McMillin kin from 7 states gathered on July 28-29, 2018 at Lake Tiak O’Khata for their 68th annual reunion. The Pine Ridge Lodge was the venue for the traditional cook out on Saturday night. President David McMillin of Monroe, LA returned to his role of chef and grilled hamburgers, hot dogs, and bratwurst. Many sides and desserts were provided, but Mrs. Shirley McMillin of Carthage, delighted all with her vanilla wafer cake and Mrs. Claire Crowell of Louisville pleased all with her mouthwatering bread pudding! MacMillan tartan flags greeted each kin at the entrance. Continuing into Sunday, the McMillins met for a morning devotional, lunch, business meeting and program. The Colonial Room was decorated with traditional MacMillan tartans as well as American and Scottish flags. This year’s lovely centerpieces, created by Ashlie McMillin Johnson, of Athens, GA, and sister, Melissa McMillin Crew of Ringgold, GA displayed a medley of flowers that complemented the tartan colors: sunflowers, Queen Anne’s lace, Scottish Thistle, Hypericum berries, and seeded eucalyptus. Janet Donoho, of Dallas, TX and Bonnie Broadway of Pascagoula assisted with registration and name tags. The McMillin Grands marched in singing the “McMillan Rallying Song” written by Somerled MacMillan and the reunion began! President David McMillin welcomed each guest and presided over the day’s event. Larry Woodward of Louisville gave an inspiring devotional entitled, “God’s Holy Word”. He referenced a Bible that had been his grandmother’s and told how she had marked each time she had completed reading it. Larry stressed the importance of reading, knowing, and following God’s word. Following the devotional, Barbara McMillin, of Louisville, beautifully declared the gospel through song with “Amazing Grace My Chains Are Gone.” Rev. Percy Mac Frazier of Franklinton, LA, offered the blessing for the meal. In keeping with tradition, several awards were given: Youngest McMillin attending was 9 month old Grayson McMillin, son of Paul and Hannah McMillin and grandson of Jamie and Lisa McMillin of Louisville; Most senior in attendance was Sue Bennett Fulcher of Louisville, at the wise age of 93; persons traveling the greatest distance again went to sisters, Sue McMillin Faulkner and Jane McMillin of Lampasas, TX ; the person having the most immediate relatives attending this year went to John McMillin of Chattanooga, TN. Jamie and John McMillin often battle for this award! Jamie’s count for this year was 12 —John’s count was 13. Each person or representative stood and told how he/she is related to William McMillin, the immigrant who came to America around 1799. Several kin told of eventful happenings in their lives since the last reunion: Jamie and Lisa McMillin added 3 grandchildren to their family (Grayson, son of Paul and Hannah, twins Ann Chambliss and Chandler Marie, born June 22 to Jonathan and Meredith from Madison); We were excited to learn of Barbara McMillin’s engagement to Patrick Ezell, who was a guest this year; David & Leesa McMillin’s son, Cody is stationed in Sicily with the US Marines and Brady just graduated from law school and is waiting on results from the bar exam; John & Sylvia McMillin had two grandchildren graduating from high school (Lucy Johnson of Athens, GA and Jacob Crew of Ringgold, GA; Jamie Faulkner, wife of Andrew Faulkner of Houston, TX will continue her degree at Texas A&M in the fall! We were saddened to hear of the death of Charles Curry, Betty Bennett Curry’s husband from Tupelo. Jane McMillin, daughter of the late Dr. Rush McMillin and granddaughter of the late Virgil McMillin, of Lampasas, Texas, titled her program, “The McMillins of Winston County: A Family Album.” Jane characterized her presentation as a sampling of McMillins past, who first came to Winston County, Mississippi from South Carolina more than 180 years ago. The McMillins refer to their American forbearer as “William, the Immigrant,” who was born in Belfast, Northern Ireland about 1763, and came to America around 1799 as one of thousands of Ulster Scots or “Scots-Irish” immigrants. He was about 36 years old and married Margaret Elizabeth McInnis, who also was a Scots-Irish immigrant. They lived in South Carolina a little over 30 years before they moved to Winston County. Grandpa William was about 72 when made the trip to Mississippi. According to one family history, the McMillin’s oldest daughter, Mary, who had married Nat Woodward settled in Winston County in 1834, a year before the rest of the McMillins made the move. Mary’s parents and eight other siblings came to Winston County around 1835. William and Margaret Elizabeth McInnis McMillin are buried at the Old Baptist Cemetery in Louisville, as are their oldest son David and wife Margaret Ann and several of their children who died young. In 1984, McMillin descendants dedicated a large granite marker honoring their ancestors buried there. On the reverse side of the monument are some 30 names of related families, those joined by marriages to 2nd and 3rd and 4th generation McMillins. So at the singular spot – and at a single glance – we can see the richness and all the interesting interconnections that make the bonds of our kinship such a vibrant force in our lives. “It is what Shakespeare described as ‘the grace of kinsmen.’ And for us, it goes back almost a thousand years to medieval Scotland,” Jane McMillin noted in her July 29 presentation. The Scots-Irish McMillins of Winston County, Mississippi, likely were originally part of the Galloway Branch of the Clan MacMillan in southwest Scotland. The Galloway area is only about 40 miles by sea from Northern Ireland, so migration was common throughout the centuries. Although the family name dates to the 12th century, the lineage of the Clan Chief has been traced to the early 10th century, some 200 years before the name “MacMillan” came into use. The 69th reunion will be held on July 27-28, 2019 at Lake Tiak O’Khata. From TENNESSEE: Danna McMillin Bennett, Mt. Juliet; Ann McMillin, Ooltewah; John & Sylvia McMillin, Ooltewah; Jimmy Moore, Collierville; Keith Moore, Memphis; From TEXAS: Janet Donoho, Dallas; Andrew, Jamie & Mac Faulkner, Houston; Sue McMillin Faulkner & Jane McMillin, Lampasas. Public Service Commissioner Brandon Presley announced today that the first meeting of the Winston County Task Force on improving cellular telephone and high-speed internet service will be held on Tuesday, August 21, 2018 at 7:00 p.m. The meeting will take place at the Winston County Courthouse, located at 115 South Court Avenue in Louisville. “Rural Mississippi has an infrastructure crisis in the lack of cellular telephone service and high-speed internet service. Mississippians are sick and tired of paying for a service that doesn't work or being told that providers have no intention of serving their areas. That is unacceptable to me and through the help of these citizen task forces, we are going to highlight this problem and demand answers," Presley said. "The information gathered that we will use to prove that the FCC's maps for funding are wrong will be due soon, so we have a lot of work to do in a very short time. That is why citizen volunteers are so very important." Among other projects, citizens involved with the task force will be able to use a free smartphone app, approved by the Federal Trade Commission, to document the lack of cellular telephone and data service in their area. The FCC currently shows that Mississippi has adequate service in almost every county of the state. This false information could cause Mississippi to lose millions in federal funding for cellular telephone towers in rural areas. Also, the task force will meet with leaders to look at what solutions exist to bring high-speed internet service to rural areas. “While we have had many volunteers, we always welcome more. This meeting is open to the public and all are welcome to attend,” said Commissioner Presley. Anyone interested in serving on the task force should contact Commissioner Presley’s office at 1-800-637-7722. THE LAST DAY TO REDEEM 2015 LAND TAXES IS AUGUST 29, 2018, AT 5:00 PM. AFTER THIS DATE, THE PURCHASER MAY REQUEST A TAX DEED TO SAID PROPERTY. On Saturday, April 28, 2018, Yasmean Carmeisha La’Jalan Hunt and Asia Eichelberger were awarded the Michael Sherrod Eichelberger Scholarship. Carmeisha graduated from Louisville High School May 2018. She participated in the following clubs in school: Beta Club, Mu Alpha Theta, SLICE, SADD, Slow-Pitch and Fast-Pitch Softball, Soccer, Anchor Club, and Mayor’s Youth Council. She was awarded English 1 Award, First Team All-District twice in Soccer, 2nd Team All-District in Slow-Pitch Softball, Honor Graduate, MS scholar and National High School Honor Society. She plans to attend Ole Miss to major in Business Management to own an elite sports academy. She is the daughter of Carl and Barbara Hunt. Asia Eichelberger graduated from LHS as an honor student May 2017. Asia was the 2017 Mississippi Gold Medal winner of the NAACP ACT-SO Olympics. She was awarded many honors and awards while in high school. She entered the University of Mississippi-Oxford in September 2017 to pursue a degree in Business Management and presently is a 2nd Semester Sophomore honor student. She is the daughters of Paul and Rita Jackson-Eichelberger. Cadet Command Sergeant Major (CCSM) Michael Sherrod Eichelberger was 17 years old and was a senior at Noxubee County High School in Macon when he died in a car accident on Hwy. 45 in Macon, MS, October 31, 2005. This scholarship is awarded to students annually who meet the criteria set by Michael Sherrod’s parents drafted from his portfolio of his achievements in his brief life. It is given to keep alive the memory of a young man who was a dependable hard worker, loyal, obligation fulfiller, respected by everyone and totally dedicated to his parents, sisters, extended family members and others. He was a great winner and highly competitive role model. The scholarship is dedicated to creating opportunity for math, science and engineering students. Donations can be made to this scholarship: Michael Sherrod Eichelberger Scholarship Foundation, P. O. Box 1044, Macon, MS 39341. MS, on August 2 & 3 at the Greenville Higher Education Center. 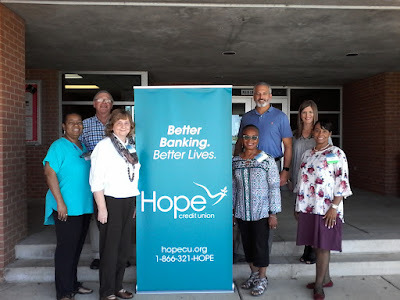 Small Towns, Big Impact: Community Leadership Institute was an invitation only event sponsored by Hope Enterprise Corporation & Hope Credit Union in partnership and training provided by NeighborWorks America Training Institute. 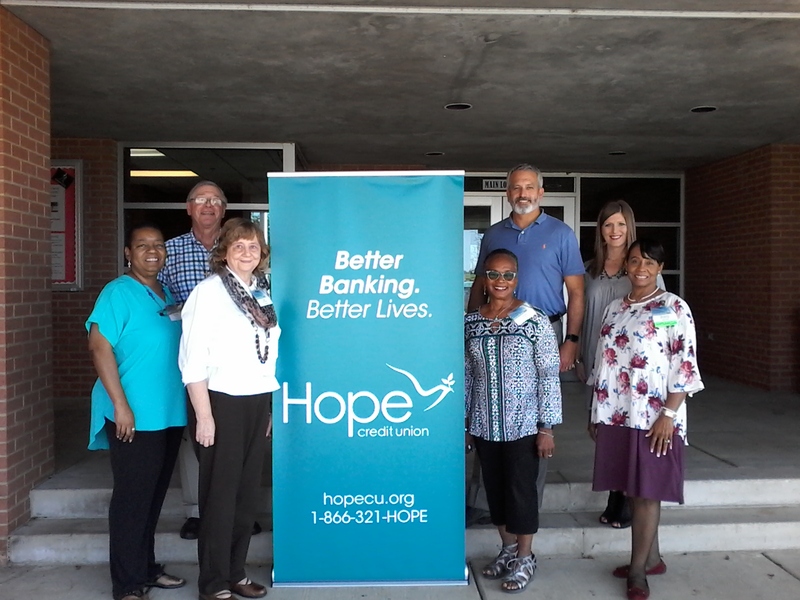 This partnership with Hope has been a work in progress and ongoing project to provide training and assess needs throughout the community. Mayor Hill attended a week long training session in the Fall of 2017 in Philadelphia, PA. Mayor Hill was honored for the City of Louisville to be selected for this program and the opportunity to have a place-based curriculum offering in Mississippi to host a group of leaders representing a wide array of interest in Winston County. The training consisted of community development through involvement and putting plans into action. As a result, the group looks forward to announcing support of a community project very soon and is grateful to Hope Enterprise for the opportunities provided. Those attending were Carnette Hudson, Ada Woodward, Carolyn Hampton, Barbra Eichelberger, Mike Dowd, Mayor Will Hill, & Lacey Vowell. Northern District Public Service Commissioner Brandon Presley announced today that the Public Service Commission has revoked the certificates of 17 telecommunications companies to do business in Mississippi due to their failure to provide the PSC with an annual report detailing their business activities in the state. Presley said that the businesses were not only out of compliance with the PSC, but also the Secretary of State’s office. “We will not allow these companies to just flaunt the law. If you fail to respond to us, we cannot believe you are responsive to your customers,” Presley said. Presley added that consumers who are receiving telecommunications services from any of the seventeen companies should immediately notify his office toll-free at 1-800-356-6428 or 1-800-637-7722. University of Mississippi Chancellor’s Leadership Class meets Ben and Erin Napier from HGTV’s hit series Hometown. Two of the students are from Louisville, MS.
Louisville can be proud that it has two National Taekwondo winners. Each of them won four medals at the 2018 United Taekwondo Alliance National competition in Bossier City, Louisiana, July 26-28, 2018. Charisma Edward, 22 years old, won gold in the Women’s Team Sparring, silver in the Individual Point Sparring, bronze in the Women’s Individual Form, and bronze in the Women’s Olympic Sparring. Master Instructor Willie D. Matthews won gold in the Team Form Competition, silver in Team Sparring, silver in the Individual Sparring, and Bronze in the Individual Form. According to 61 year old Matthews this was the first time he has competed in Individual Form which shocked him when he won a medal. This team would like to thank those who helped to sponsor them in the National Competition. The next competition will be in the Dominican Republic November 2018. Stay tuned for more details. Sponsors are needed to help with their expenses. The school is in partnership with Friends of Dean Park, Inc. Donations may be sent to Friends of Dean Park, Inc, P. O. Box 365, Louisville, MS 39339. Please note in ‘memo’ for Taekwondo Competition. Panthers Taekwondo School is still open for enrollment for 5 years and older - with registration fee $25.00. The classes are free and are held at the Louisville Coliseum. For details, please contact Master Instructor Willie Matthews, 662.705-8656. Taylor Hall was presented the Chyna Unique Willis Scholarship, Saturday, June 24, 2018, at the Calvary Apostolic Church, Louisville, MS. with Elder James Young as the pastor. Chyna’s mother, Kenisha Hughes and last year’s winner, Asia Eichelberger presented the scholarship with former winner Montana Eichelberger present. Taylor graduated from Louisville High School May 2018. She was a member of the following clubs and activities: B eta Club, History Club, SLICE, Mu Alpha Theta, Student Council, Band, Tennis, SADD, and FCA. She was honored to be the Beta Club Secretary her junior year, Color Guard Captain her senior year and Freshman Class Vice President. Taylor plans to attend Ole Miss to major in English and Creative Writing with a minor in cinema. She is the daughter of Charles and Tracy Fairley. This Chyna Unique Willis scholarship is given in memory of Chyna Willis who passed away quite suddenly and unexpectedly in 2012 at the young age of 13 years. According to her mother, “Everyone who knew Chyna was saddened by her untimely death. Chyna was committed to being the best that she could be and loved life to the fullest. Chyna was active in church as well as school. She participated in youth activities and ran track. She loved the Lord and was an avid lover of sports as well. She was a friend to those who got to know her for themselves and she cherished their friendship. I would like to continue to honor Chyna's efforts of being the best she could be in whatever it was she set out to do by blessing another child. I started this scholarship three years ago and it was successful, so I would like to continue it to be a blessing in the years to come. Same as other years, the scholarship will be given away in the generous amount of $500. As the years pass, I plan on moving this amount up but with your help! I ask you to help me to keep making this a memorable event to look forward to every year and see the smile on another child's face. If you have any questions, please feel free to contact me. Thanks in advance for your generosity in helping make this possible. May God bless each giver double fold.” Leslie Loving, Lillian Curtis, Rita Eichelberger and Anastashia Gill are on the Chyna Unique Willis Scholarship Committee. 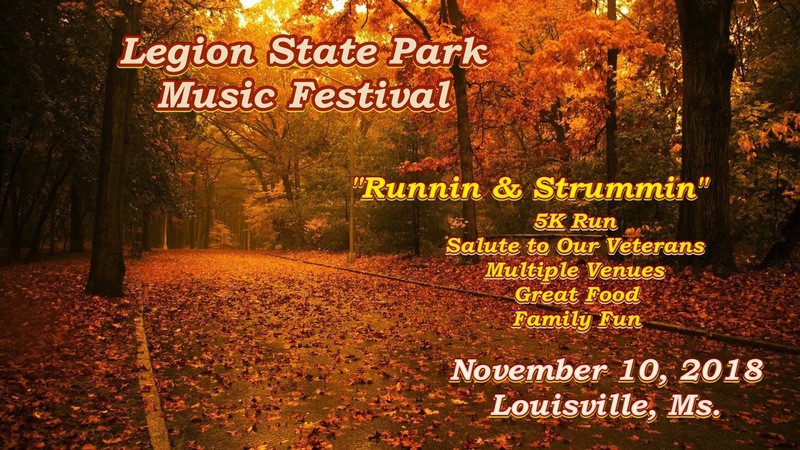 The Gifted by God Praise Team of Philadelphia performed at this event.